CBSE Board 12th Results: Finally, the CBSE Class 12 Results 2017 for all the CBSE regions ready to be declared on the official site cbse.nic.in on May 28 before afternoon. 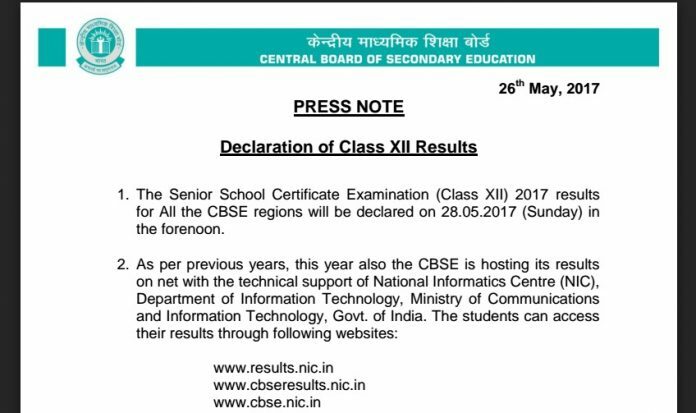 The Central Board of Secondary Education has released an official notification on the CBSE XII Results Declaration. Huge number of students are waiting for the CBSE Senior Secondary Examination results from many days. After a long delay in the announcement of the Class 12 results, the CBSE has released an official press release under the name Rama Sharma. The released PDF also advised students not to visit board’s office seeking results. According to the published document, the verification process shall be updated shortly on the official website. No press release for the CBSE class 12 results, the highlights will be mailed to the candidates shortly. Take a print out of the results for future purpose.